almost as direct a language as speech. At the bottom edge of the triptych the canvas shows in places. 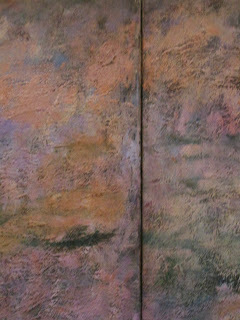 large painting, not as three separate works. display. It's a triptych, more than 40 feet wide. the way that Monet did. Labels: Monet at the MoMA, New York City. What a fabulous post, Barbara! Thank you! It is awe inspiring to stand and have the privilege of experiencing the 'artist in the room' in the situation that you are talking about. I have felt that same feeling on several occasions in front of great art. Lucky you to enjoy it this month. Cant wait to meet you on Tuesday. I will have some lunch on for us just after you arrive. And I will call Susan too because I know she'd love to see you too. Is this okay for you? So breathtaking. Thank you for sharing this experience with us. Thank you so much. Lucky you heading to Monet's garden at Giverny. I would so love to go there. Yes isn't it a wonderful thing to feel the strength of an artist's presence in the work. I can't wait to meet you too. I am loving your work each day. I feel sad that you must be half way through your month of paintings. I just love seeing them each day, and wondering what you'll paint today.